This province-wide walkout, which was participated in by hundreds schools, both secondary and elementary, came in the wake of the provincial government’s, “Education that Works for You” plan. It was also a precursor to a rally that was held in Toronto on Saturday. 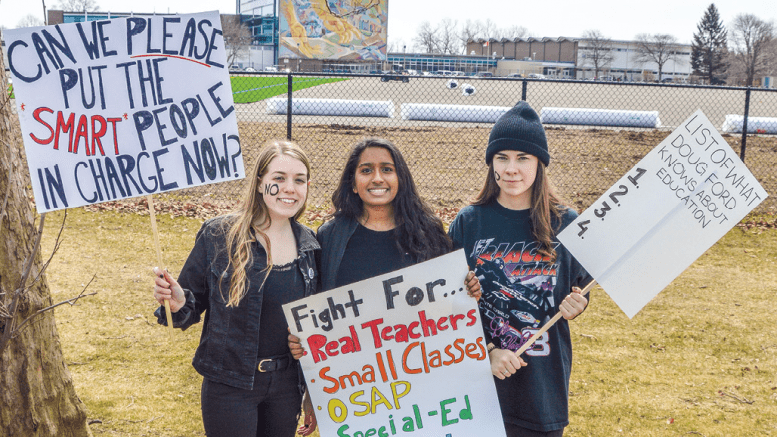 Teacher associations, including OSSTF, were involved with planning the rally, which saw numerous teachers and students come together to protest the changes to the education plan. The government, under Premier Doug Ford, issued a statement March 15 that outlined the intended changes that were to be put in place to improve education across Ontario. The plan includes increasing class sizes, hiring teachers based on merit rather than seniority, requiring students to take a minimum of four e-learning (online) classes, banning cell phones in classes, and introducing new math curricula, among other changes. Also announced were the proposed changes to funding for autism. In an effort get 23,000 children off the wait list for funding, the provincial government is proposing to distribute funding directly to families. Following these releases, information and news articles soon circulated that outlined potential problems with the proposed changes. In particular, the changes to class size, the addition of mandatory e-learning classes, and the changes to funding for autism have been criticized. There is worry that the changes to class size and required e-learning will result in a decrease in teaching positions and the possible layoff of current teachers. Other articles focus on the changes to autism funding and suggest that the changes could mean that families currently receiving funding will receive less than before, and, because the funding is not needs-based, some families may not receive what they need to support their child. She and fellow organizer, Erica Carter, did their best to educate themselves on the topic. Pelham’s school board Trustee, Nancy Beamer agreed. “I think in the educational sector it’s a very stressful time with all the changes that are coming down and until everyone understands all the implications there’s always that feeling of uncertainty,” said Beamer. Former E. L. Crossley Principal and recently retired Student Achievement Leader for the DSBN, Ann Harrison, expressed her concerns. This worry has been repeated by students Tessa Piccolo and Erica Carter. The two girls were not the only students to express concern over what these changes meant. In their search for information about the changes, they came across the Instagram page, “Students Say No,” a group composed of students from across Ontario who wanted to protest the changes. The group encouraged high schools to register to participate in the April 4 walkout, offering them a platform to sign up on. Once registered with the group, high schools received information packages that explained the goals of the walkout and their expectations for those participating, ensuring the same information and procedures for the walkout was disseminated to all participating schools. Piccolo and Carter registered E.L. Crossley for the walkout, and, in turn, passed the information on to their peers. In addition to participating in the walkout, E. L. Crossley students also signed a petition outlining their concerns with the intention of passing it onto Niagara West MPP Sam Oosterhoff, who is also Parliamentary Assistant to the Minister of Education. By press time, Oosterhoff’s office had not responded to a request for comment. As of last Wednesday morning, some 800 schools across the province had registered to participate, according to published reports, including several schools in Niagara. Both Sweeney, and DSBN Trustee Nancy Beamer said that students students would not be penalized for participating in the walkout beyond being marked absent for that period. Crossley students also passed around a petition that they intend to present to MPP Oosterhoff, reflecting their position on the new education changes. For many of these students, the increased class sizes, mandatory online classes, and cuts to autism funding were of the most concern, and, for many, a cause of anger. Although the protesters consisted of students from every grade, the majority were from Grade 12. Nigel Casson, a Grade 12 who held a sign saying, “Things Doug Ford knows about education,” followed by a blank list, said that he intends to return for another year of school, Grade 12B, and therefore is protesting because these changes will affect him. Other students, who were not intending to return to high school next year, still felt it was important to participate in the protest. Tessa Piccolo said that the proposed changes would affect generations. Others were looking out for family or friends. Grade 12 student Emma Leavens was protesting because she knew that these changes would “deeply affect” her younger sister, who will soon enter high school. While many cited autism funding, class size, and mandatory e-learning as their reasons for protesting, an overwhelming number of students had also come out in support of their teachers, whose jobs they felt were threatened by the changes in education. Grade 11 student Kyle Glenney said that in addition to having many family and friends who were teachers, he has thought about being a teacher one day. For him, protesting was not simply a matter of looking out for his own immediate interests, but a matter of looking out for his future, and the well-being of others. Jenna Veerman, a Grade 12 student, said that “teachers have done so much for me personally,” and that it was only fair that she protest on behalf of them.